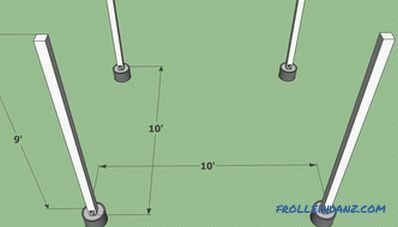 This article is about how to build a tree gazebo with your own hands. If you have a large garden and you want to enjoy your time there with your family and friends, the gazebo is perfect for this. Just imagine yourself in a beautiful self-built gazebo, watching how your children play on the grass. 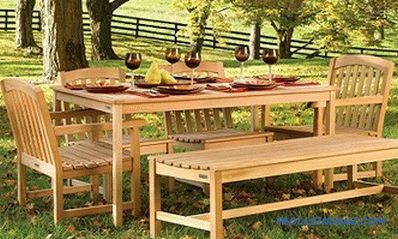 In addition, a gazebo is a great place to share a family dinner. On hot summer days, it will protect you from the scorching sun and serve as a cozy place for privacy with your favorite book. 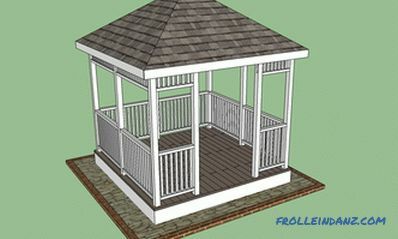 The construction of an arbor is not difficult, provided that you use the right materials and you have a plan. In order to have a gazebo fully in line with your tastes and needs, you must take a responsible approach to the planning and drafting process. You have to decide in advance what its dimensions should be, whether you want to lay the floor here, install a brazier. The options are many, so we recommend that you spend some time planning. However, it should be remembered that each additional function implies additional costs, so it is necessary to balance the balance between your desires and capabilities. 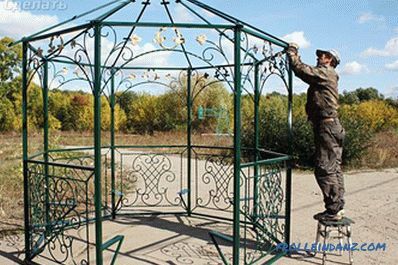 At the preparatory stage, you should decide on the design of your future gazebo. There are also a lot of options: it could be, for example, an octahedral structure or a fairly simple square one. 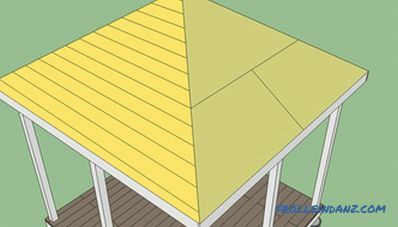 In this step-by-step instruction, we will show you how to create your own gazebo in just a couple of days off without spending too much money. 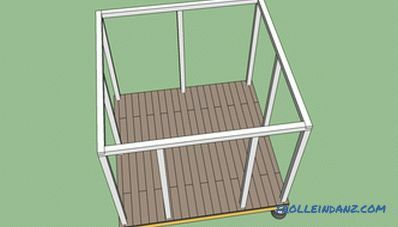 The construction of a wooden gazebo is an easy task, provided that you are familiar with the basics of wood processing. F - Wooden stands: timber 10 * 10 cm long 270 cm (9 pieces); Protective gloves, goggles. 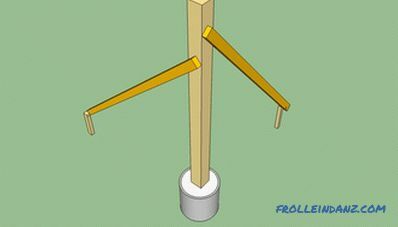 Building a tree gazebo with your own hands is a rather complicated project, but even an amateur can cope with this task if he uses a properly made plan and suitable materials and tools. 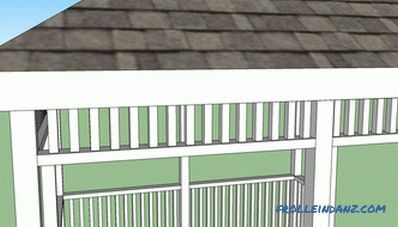 You have to install several racks, lay the floor, make the roof and railings. At first glance, this may seem very difficult, but do not be afraid: to achieve the goal, you should follow our step-by-step instructions and be very attentive in your work. Tip: At the very beginning, calculate the amount of materials you need, otherwise you will spend a lot of time on endless visits to the hardware store. Make sure that the power tools you use are in good technical condition, and their blades are sharp enough. 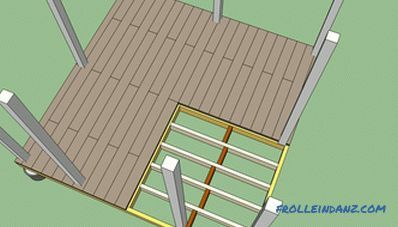 Before starting work, you must choose a flat section for construction and designate the perimeter of the future arbor with pegs and a rope. Tip: Measure the diagonals of the square — they must be equal. Check each angle for perpendicularity by applying the well-known rule "3-4-5" (according to the theorem, which everyone remembers well from school, the hypotenuse of a right triangle with 3 m and 4 m legs must be equal to 5 m (32 + 42 = 52)) . There are several ways to fix wooden poles, most often they are fixed with concrete or hardware. If you want to install racks in concrete, you must dig holes in the ground 60-90 cm deep, cover and tamp down a 5 cm layer of sand or gravel and pour a 10 cm layer of concrete. After that, place each rack into the hole and, using a plumb line or level, expose it perfectly vertically. After vertical alignment of the wooden poles, fasten them in two directions, otherwise they may move. Ways of fixing the rack in concrete. As an alternative, you can put tubular formwork (a piece of large diameter pipe) into a hole that has been dug out and fill it with concrete. 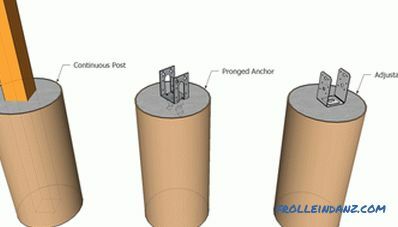 When the concrete has hardened slightly, adjustable anchors should be put in place, making sure that they are perfectly aligned with each other. Tip: When installing racks, you must align them properly so that the square they form is perfect. Vertical alignment of the rack. 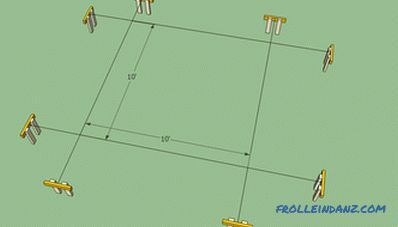 Use the ruler and level to make sure that the four concrete supports are perfectly aligned. Let the concrete dry before installing the racks for at least 48 hours. Tip: Support the racks before fastening them with bolts / screws. Use a spirit level to make sure that they are vertical and aligned. 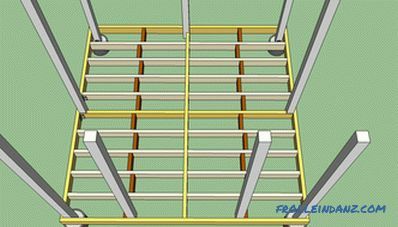 To create a floor frame, use wooden bars of 5 * 15 cm. 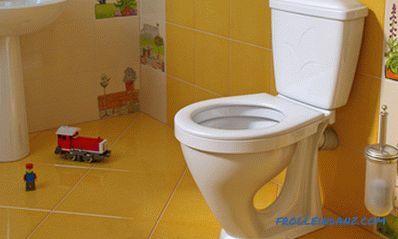 Lags must be laid every ~ 40 cm so that the design is quite rigid and can withstand the weight of the flooring. Tip: When leveling the floor, use a level: you must be sure that the logs are positioned strictly horizontally. You have two options for fixing lags inside a wooden frame. 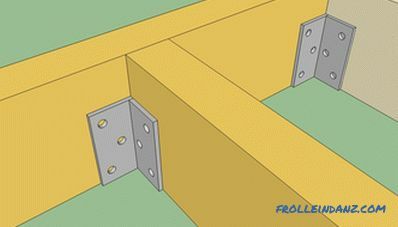 You can screw 10-12 cm of screws into the end of each lag through the bottom strapping perpendicular to them or use metal corners (clamps for fixing the ends of wooden beams). We recommend you the second option, however, if you wish, you can use the first one, but do not forget to drill the guide holes before screwing in the screws. Now it's the turn to install the remaining racks that will support the top trim and roof. If you want to build a solid structure, we recommend that you fix the racks on the logs using 15 cm nails. Tip: Do not forget to vertically level the stands with a plumb line before mounting. Roulette will help you place the support symmetrically. After you created the floor sheathing and installed the wooden racks, it is time to lay the floor. We recommend that you buy floorboards for outdoor use for this purpose, otherwise the floor of the gazebo will soon become unusable under the influence of atmospheric moisture. Before nailing, we strongly advise you to drill holes. If you use screws, you can twist them without drilling. Tip: Each floor board should be secured with two screws from each end. 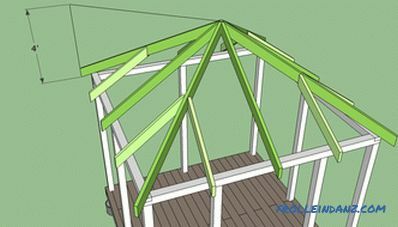 There are several ways to make a roof of an arbor. We will show you an option that, firstly, does not require a large amount of materials and, secondly, makes the arbor durable. The first step in the process is to install the top trim of the wooden poles. Use for this purpose bars 10 * 10 cm. In the picture below you can see the correct technique of fixing the bars. At the ends of each bar, you need to make L-shaped cuts and join them together at the top of the uprights. After that, drill the guide holes and drive in 15 cm nails. Tip: We recommend that you use solid bars for tying, otherwise the rigidity of the structure will be significantly reduced. Now you can install the roof frame.To begin, cut out the supporting bars of the truss truss and fix them in pairs, hammering the nail at an angle. Even if you dreamed of building a wooden arbor with your own hands, you cannot do without an assistant at this stage. Tip: When installing rafters, you will need a ladder. Make sure you give her a steady position. 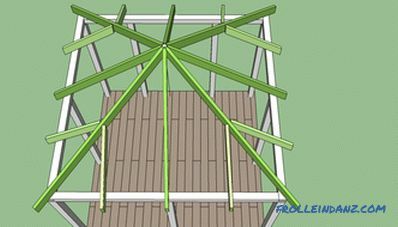 Construction of a gazebo roof. 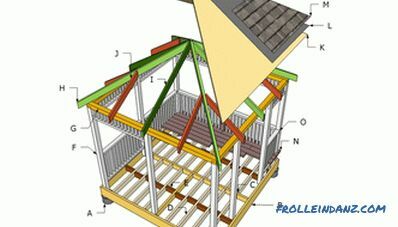 Then install the auxiliary rafters as shown in the figure. Make sure that you place them symmetrically. Fix them on the top trim and on the main rafters with 10 cm screws. Tip: You can change the size and height of the gazebo to fit your needs and tastes. Installation of the roof of the gazebo. 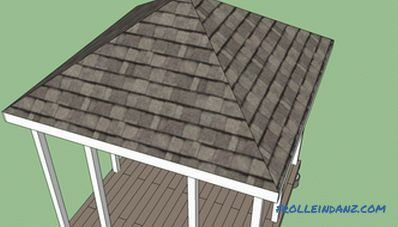 Arbor roofing can be done in several ways: you can use for this purpose, for example, wooden boards or large sheets of plywood. Regardless of your choice, we recommend twisting the screws every 25 cm along the rafters to fasten the roof material. Tip: Using boards as a roofing material will require more time and labor of a qualified worker. Installation of the roof of the arbor. 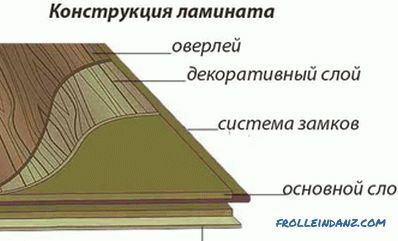 The surface of the roofing material (wooden boards or plywood sheets) must be covered with roofing paper and then with shingles, wooden shingles or metal sheets. Our experience shows that the costs in all these cases are commensurate, so you should choose the option that suits your needs and tastes. Work with great care, make sure that the nails do not damage the roof (use 1 cm roofing nails). The last, but no less important than all previous, stage of work is the creation of a fence. 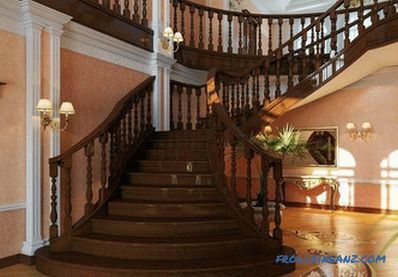 There are many options for baluster design, here you should rely solely on your taste. Usually, balusters 70–80 cm high are used, but you can adjust this value to suit your needs. 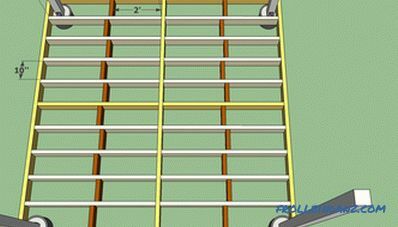 The lower and upper horizontal bars of the fence should be secured with self-tapping screws, screwed at an angle, or with metal corners. 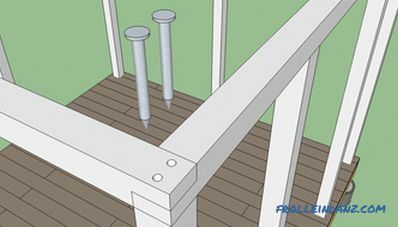 Tip: It is not necessary to drive nails into the ends of balusters through the railing; for fastening elements of the fence it is better to use hidden connections, for example, dowels. Similarly, the upper border can be made. 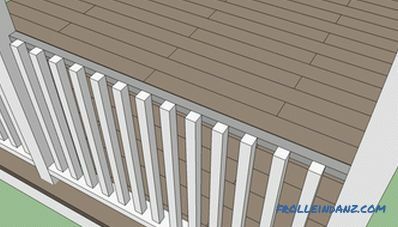 As well as below, use there boards 10 cm wide for the lower and upper trim and 5 * 5 cm bars for balusters. Make sure that the decorative fencing you created has a neat appearance, and its design matches the style of your entire gazebo. Finishing the upper part of the arbor. Once again, examine the arbor with a critical eye. Fill the cracks and holes with wood putty. Sand all wooden surfaces with medium grit sandpaper. Protect all wooden construction elements from moisture, covering them with several layers of varnish. So that the gazebo you created perfectly matches your needs and tastes, do not follow the advice of others without thinking. From the very beginning, choose a design and size that suits you.